Providing you the best range of elevator conveyors for food industry with effective & timely delivery. With the help of our expert team members, we have been able to offer a wide range of Elevator Conveyors for Food Industry. These are designed and developed as per international industrial standards and using advance technologies. Demands of these devices are increasing owing to its excellent service life and high functional efficiency. We also offer these in customized dimensions and sizes. 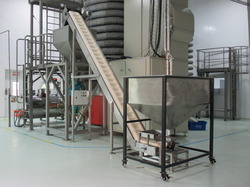 Looking for Elevator Conveyors for Food Industry ?